This coming Sunday (March 24) is the Third Sunday in Lent. We will be using the second setting of the Divine Service, configured as a Service of the Word. Because we are in Lent, we will omit the Hymn of Praise and use the Verse for Lent instead of the Alleluia Verse. As we go deeper into the season of Lent the service gets more and more sparse. This week we begin omitting the chanting of the Kyrie and the Salutation. Instead, they will be spoken. Our opening hymn will be “May God Bestow on Us His Grace” (LSB 823). Our sermon hymn will be “I Lay My Sins on Jesus” (LSB 606). Our closing hymn will be “Jesus, Refuge of the Weary” (LSB 423). These all have well-known tunes. The appointed lessons for Sunday are Ezekiel 33:7–20, Psalm 85 (8), 1 Corinthians 10:1–13, and Luke 13:1-9. The readings and my initial impressions are below. The same readings will be used Wednesday, March 27 and that message will be based on the Psalm. 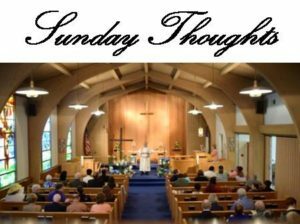 The Sunday sermon is titled “Why, Lord?” The text is Luke 13:1. 7 “So you, son of man, I have made a watchman for the house of Israel. Whenever you hear a word from my mouth, you shall give them warning from me. 8If I say to the wicked, O wicked one, you shall surely die, and you do not speak to warn the wicked to turn from his way, that wicked person shall die in his iniquity, but his blood I will require at your hand. 9But if you warn the wicked to turn from his way, and he does not turn from his way, that person shall die in his iniquity, but you will have delivered your soul. 10 “And you, son of man, say to the house of Israel, Thus have you said: ‘Surely our transgressions and our sins are upon us, and we rot away because of them. How then can we live?’ 11Say to them, As I live, declares the Lord GOD, I have no pleasure in the death of the wicked, but that the wicked turn from his way and live; turn back, turn back from your evil ways, for why will you die, O house of Israel? 12 “And you, son of man, say to your people, The righteousness of the righteous shall not deliver him when he transgresses, and as for the wickedness of the wicked, he shall not fall by it when he turns from his wickedness, and the righteous shall not be able to live by his righteousness when he sins. 13Though I say to the righteous that he shall surely live, yet if he trusts in his righteousness and does injustice, none of his righteous deeds shall be remembered, but in his injustice that he has done he shall die. 14Again, though I say to the wicked, ‘You shall surely die,’ yet if he turns from his sin and does what is just and right, 15if the wicked restores the pledge, gives back what he has taken by robbery, and walks in the statutes of life, not doing injustice, he shall surely live; he shall not die. 16None of the sins that he has committed shall be remembered against him. He has done what is just and right; he shall surely live. Initial Thoughts: This is a powerful lesson. In verses 7 through 9 we learn that we are our brother’s keeper. No, we can’t believe for him, but we can, and should, warn him and share the Gospel with him. God does hold us accountable, not only for what we do but also for what we don’t do. There are both sins of commission and sins of omission. Verses 10 and eleven are well known as it includes the Gospel words, “I have no pleasure in the death of the wicked, but that the wicked turn from his way and live; turn back, turn back from your evil ways, for why will you die, O house of Israel?” God never desires the death of the sinner. If someone goes to hell, it is their fault. God is always offering forgiveness to the repentant. Verses 12 through 16 also lets us know that forgiveness is always available to the repentant. However it is also a warning to those of us who believe that we are to remain in Christ. All the faith in the world will not save if we abandon it. We must cling to Christ to the end. The works spoken of should be considered as evidence of faith. This also reminds us that our words are judged. They do not merit salvation, but they are remembered and rewarded in heaven. Verses 17 through 20 depict something we see all around today. Sinful people, instead of acknowledging their sinfulness, accuse God of being unjust. It is a foolish accusation and just how foolish it is will be revealed on the Last Day. Initial Thoughts: This Psalm will serve as the text for the Wednesday, March 27 service. I will post some initial thoughts next week. For now all I’ll write is that we again see the Lord reaching out in mercy but foolish sinners can, and do, reject his mercy. We find, again, that God is always ready to forgive the repentant. 10:1 For I do not want you to be unaware, brothers, that our fathers were all under the cloud, and all passed through the sea, 2and all were baptized into Moses in the cloud and in the sea, 3and all ate the same spiritual food, 4and all drank the same spiritual drink. For they drank from the spiritual Rock that followed them, and the Rock was Christ. 5Nevertheless, with most of them God was not pleased, for they were overthrown in the wilderness. 6 Now these things took place as examples for us, that we might not desire evil as they did. 7Do not be idolaters as some of them were; as it is written, “The people sat down to eat and drink and rose up to play.” 8We must not indulge in sexual immorality as some of them did, and twenty-three thousand fell in a single day. 9We must not put Christ to the test, as some of them did and were destroyed by serpents, 10nor grumble, as some of them did and were destroyed by the Destroyer. 11Now these things happened to them as an example, but they were written down for our instruction, on whom the end of the ages has come. 12Therefore let anyone who thinks that he stands take heed lest he fall. 13No temptation has overtaken you that is not common to man. God is faithful, and he will not let you be tempted beyond your ability, but with the temptation he will also provide the way of escape, that you may be able to endure it. Initial Thoughts: Paul uses the stories gleaned from the wilderness wanderings of Israel after they left Egypt to warn the congregation in Corinth. Those people had received many blessings in Christ and yet most failed to stay in the faith. One of the problems of our fallen nature is that we do not remember the many blessings of God he has given us. We always are asking, “what about today?” We need to remember the history of God’s rich blessings in Christ to sustain us during our “todays.” He has united us to him through the waters of baptism. He has instructed us through his Word. He has fed us at his Table. He has placed us as his children in his family, the Church. Not to mention granting us temporal blessings like house and home, spouse, parents, children, occupation, and so much more. Cling to the history of his rich blessings, especially Jesus, when temptation strikes, and you will be able to endure it. Initial Thoughts: It was truly amazing that, while in Israel, we were able to see the actual tower Jesus spoke of in verse 4. 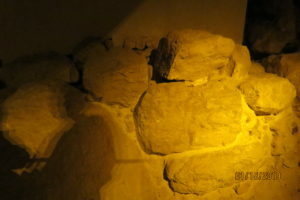 It was part of a excavation site. At any rate, this reading presents two disasters that cost lives. People seek to make sense of them. However, fallen human reason fails to understand. Jesus gives one lesson from such disasters. We will examine this explanation, as well as others presented elsewhere in Scripture, in Sunday’s message.